Secondary school teachers in Wyoming and nationwide now have a new resource that applies quantitative reasoning and science, technology, engineering and mathematics (STEM) to teaching energy and environment. 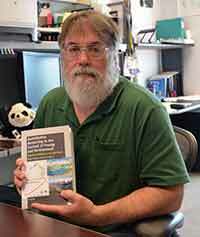 James Myers, a professor in the Department of Geology and Geophysics, co-wrote a newly published book, titled “Quantitative Reasoning in the Context of Energy and Environment -- Modeling Problems in the Real World.” Myers wrote the book with Robert Mayes, now a professor of teaching and learning in the College of Education at Georgia Southern University, but was previously director of UW’s Science and Math Teaching Center. The 454-page book is aimed at secondary school educators (grades 6-12). It provides professional development leaders and teachers with a framework for integrating authentic real-world problems into STEM classrooms. This book is the result of the QR STEM Project, a professional teacher development program offered over three years to elementary, middle and secondary science and mathematics teachers in Wyoming, and funded by the Wyoming Department of Education, Myers says. “The book incorporates elements of problem-based learning to engage students around the grand challenges in energy and environment; place-based learning to motivate students by relating these challenges to their communities; and ‘Understanding by Design’ to ensure that understanding key concepts in QR and STEM is the ultimate classroom outcome,” Mayes says. Understanding by Design is a tool used for educational planning focused on “teaching for understanding.” The teaching tool emphasizes “backward design,” the practice of looking at outcomes in order to design curriculum units, performance assessments and classroom instruction. Myers says the project encouraged the formation of professional learning communities of science and mathematics teachers to bring multiple lenses to the study of energy and environmental problems. Addressing such problems requires the simultaneous application of science, including biology, chemistry, earth sciences and physics, technology through data collection and computational modeling, engineering via system design construction and operation and mathematics through quantitative reasoning. For example, Myers says there is a chapter on coal, which teachers and their students calculate the amount of fuel -- such as coal, natural gas and uranium -- an electrical power plant requires and the carbon dioxide and sulfur emissions, and solid waste generated by consuming each type of fuel. Another chapter focuses on petroleum. A section of it explores how long U.S. petroleum needs could be met if the Arctic National Wildlife Refuge in Alaska were opened to drilling and production, as well as how America could eventually replace declining conventional petroleum production with other energy sources. Myers, who has been at UW since 1981, received his Ph.D. and master’s degrees in geology, both from Johns Hopkins University; and his bachelor’s degree in geology from the University of Rhode Island. The book, published by Sense Publishers, is available in hardback for $99 and paperback for $43 through Amazon and Barnes & Noble. Founded in 2004, Sense Publishers is an international academic publishing house with headquarters in Rotterdam, The Netherlands, and an office in Boston, Mass. For more information, go to https://www.sensepublishers.com/catalogs/bookseries/other-books/quantitative-reasoning-in-the-context-of-energy-and-environment/.